As we get into things, it might seem like we are going far afield, and like this couldn’t possibly have anything to do with cancer. I assure you, there’s a method to the madness, and what we’ll be talking about in the next couple of posts is absolutely essential ground to cover if we hope to understand the metabolic origins theory of cancer. Our cells have a few different ways of generating energy, and they can generate this energy by metabolizing different fuels. Recall from my series on fuel partitioning that our bodies can use carbohydrates, fats, proteins, alcohol, and ketones, as fuel. However, these are really just potential sources of fuel. Our bodies can’t do anything with carbs, proteins, fats, etc., per se. They first need to be converted into ATP, which is the “universal energy currency” of life on Earth. ATP is how cells “get stuff done.” In the same way you have to exchange your cash for tokens or tickets at a carnival, because the vendors don’t accept dollars and cents, our bodies have to convert fuel sources into ATP. There are a couple of different ways cells do this. We’ll start with a simple one and work our way toward the more complicated pathways. 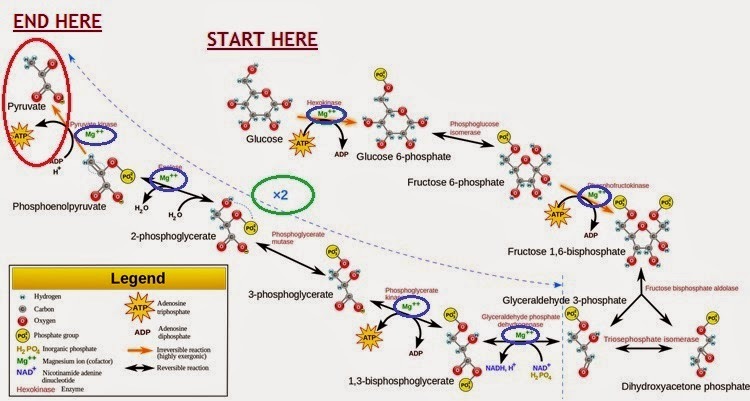 The first pathway we’ll look at is called glycolysis. The word comes from glucose (“glyco”) and breaking apart (“lysis”), so we can think of glycolysis as breaking apart glucose. After going through many steps involving various enzymes, the end product of glycolysis is 2 molecules of something called pyruvate. The process of converting glucose into pyruvate yields a net of 2 ATP. So the end products of glycolysis are 2 pyruvate and 2 ATP. 2 ATP is a small amount. Nothing to write home about. Image credit: By JohnyAbb, used with alterations through Creative Commons. Other than the enzymes and mineral cofactors (i.e., magnesium) involved in the process, glycolysis requires no special equipment. No specialized structures inside the cell, no complicated parts and pieces. It doesn’t happen in some big, fancy factory. It happens right in the cytoplasm. What the heck is cytoplasm? The cell is a universe unto itself. It’s got all kinds of neat things going on inside it. It’s kind of like a major city with its own power plants, garbage dumps and sanitation crews, recycling centers, and electrical grids. It’s got things coming and going, import and export, it’s generating and using energy, generating and getting rid of waste, and in general, just trying to stay alive. We can also think of a cell like a community swimming pool, with lots of people, beach balls, floating devices, and other stuff hanging out in it. Using this analogy, if the cell is a swimming pool with lots of activity happening in it, then the cytoplasm is the water that everything is moving around in. 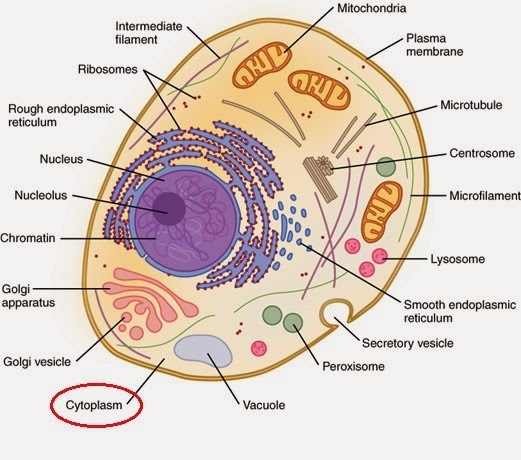 Check out this illustration of a basic animal cell. The cytoplasm is labeled toward the bottom left, so you can see it’s pointing to the environment that contains all the other stuff. And this is where glycolysis happens. Right there in the cytoplasm. There’s a reason for this. Glycolysis is a fairly old biochemical pathway. It doesn’t even require oxygen, which means it could have happened (and, in fact, was happening) way back when, in the very early days of life on Earth, like billions of years ago, back in the time of the primordial ooze, when organisms were extremely simple, and the planet’s atmosphere was not oxygen-rich. Without a lot of oxygen in the atmosphere, it’s a good thing organisms had a way of generating energy that didn’t require any oxygen, right? Now, in looking at all the steps involved in glycolysis, it’s obviously not a simplistic pathway. So it’s not simple, but it is old. And not only is glycolysis rather old, it’s also very inefficient. Like I said, 2 ATP per one molecule of glucose. Practically nothing. So we’ve got our 2 measly ATP, and we’ve also got 2 molecules of pyruvate. But the pyruvate doesn’t just sit there. Our cells convert pyruvate to lactate, also known as lactic acid. This is fermentation, and as any home beer or wine brewer can tell you, it is an anaerobic process. (Meaning, it does not require oxygen. In fact, oxygen will generally ruin this process. It happens best without oxygen.) Fermentation is also a very old pathway. So old, in fact, that it will serve our purposes for learning about cancer to think of fermentation as primitive. 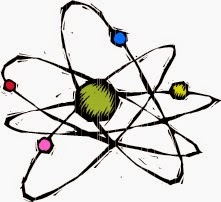 It is a primitive way for a cell to generate energy. Bacteria and yeasts do it, after all. Doesn’t get much more primitive than that. (Think of lactic acid fermentation, the magical process that converts cabbage into sauerkraut and kimchi, and milk into yogurt and kefir. Well, this doesn’t just happen all by itself; those primitive yeasts and bacteria are going to town on those sugars.) Keep these ideas of fermentation, the lactic acid it generates, and the negative influence of oxygen—in the back of your mind. We will come back to them a few posts down the line. When oxygen IS present, something interesting happens. NOW, things are about to get exciting. In the presence of oxygen, a healthy cell will not stop at pyruvate and 2 ATP after glycolysis. A healthy cell will not turn to fermentation and generate a whole bunch of lactic acid. (*See note at the end.) A healthy cell will take one molecule of glucose and generate 36 ATP—eighteen times as much as we get from glycolysis! It does this through a process called cellular respiration. (This is not the same kind of respiration our lungs perform by exchanging carbon dioxide [CO2] for oxygen [O2], but the word “respiration” is helpful for us here because it reminds us that oxygen is required. Plus, that’s what all the textbooks call it, hehheh.) Another super-fancy science word for this generation of energy from glucose (and other substrates, which we’ll get to in future posts) in the presence of oxygen is oxidative phosphorylation (OxPhos). Don’t be worried about remembering all these names. I’m just sharing them so we can have at least some familiarity with the correct terminology. If you are feeling overwhelmed right now, don’t worry. I am going to keep things as simple as I can without completely compromising the scientific integrity. This is a basic, basic primer on cellular energy generation for the specific purpose of facilitating our understanding of the metabolic theory of cancer. The specialized equipment required to use oxygen to generate ATP are mitochondria. (This is plural; the singular is mitochondrion. But we pretty much never hear talk of a single mitochondrion, because inside just one cell there are sometimes thousands of mitochondria.) Some cells have more than others, depending on their physiological function. The heart, for example—cardiac muscle cells—are loaded with mitochondria. And good thing, no? The heart muscle never stops working. From the moment your heart starts beating inside the womb, until the minute it stops permanently, it’s working. And that work—the work of pumping about 5-6 liters of blood through your body— requires an enormous amount of energy—specifically, energy in the form of ATP. So there had better be plenty of mitochondria there to generate it, no? Mitochondria are believed to have at one time been their own, independent organisms. We’re talking billions of years ago, back in the days of the aforementioned primordial ooze, when extremely simple organisms ruled the Earth. It is theorized that through some weird fluke, some early, super-simple organisms “engulfed” some of these free-standing mitochondria, and because the mitochondria could generate additional energy through using oxygen, this gave those simple organisms a survival advantage as the Earth’s atmosphere became richer in oxygen. They could generate much more ATP than organisms without mitochondria. More ATP means more energy to move, grow, reproduce, and do pretty much anything an organism might want to do, such as evolve into something more complex. Just as we can think of glycolysis, and even more so, fermentation, as early, primitive methods of energy generation, we can think of cellular respiration via mitochondria as a kind of “advanced” mechanism. And since we know that, for the same amount of glucose, it generates so much more ATP than glycolysis does, it’s certainly more efficient. I’ve been promising to keep my blog posts a little shorter. I have already reneged on that here, so let me stop for today. Next time, we’ll look at the actual physical structure of mitochondria--the big site of ATP production--and start delving into what might happen if that structure were compromised somehow. *Note on lactate: Regarding healthy cells and fermentation: healthy cells can and do ferment pyruvate into lactate. They generally do this when they need even more energy than can be provided by OxPhos, such as in muscle cells during intense physical activity. Very hardworking muscle cells need as much energy as they can get, as quickly as they can get it, so they’ll use any and all pathways at their disposal, including fermentation. This is why we have a buildup of lactic acid in muscles at or near the point of exhaustion/failure. (Although it seems that the lactic acid is not the cause of the fatigue.) It also explains why intense and/or fast activity is said to be more “glycolytic” than slower, less intense movements, as we discussed here. Generally speaking, the greater the degree of intensity and speed of an activity (such as sprinting), the more it is powered by glucose, and the less intense the activity (such as walking), the more it is powered by fat. So yes, perfectly healthy cells will take advantage of fermentation, BUT, the important thing to remember here is that it is not the primary energy generation pathway. It’s kind of a backup. We’ll talk more about this when we get back to cancer specifics. NO - it will be read. We want to complement you, Amy, for a superbly understandable description of glycolysis and oxidative phosphorylation. We urge all of you who are reading this to tweet everyone you know to follow this series. If you know statistics - the information presented here may someday save your life or that of a friend. The study of cancer as a metabolic disease is the only hope that it will ultimately be recognized as another chronic inflammatory disease that is amenable to complete cure as well as prevention. Incidentally, we were delighted that you mentioned that mitochondria were once little independent critters. We were surprised when we learned that mitochondria evolved as little furnaces well BEFORE the advent of life itself. Keep heart, Amy. All of this hard, but vital task will NOT be in vain. Great information. The presentation is wonderful. Keep going Amy, there's more than two people who are fascinated by this. Love your blog! Hi Amy. Great stuff; really enjoying it. The issue of cells not using fats and ketones effectively if the mitochondria are not numerous or functionally correctly.....sounds to me as if this would also (apart from the cancer link) have implications in terms of being a fat burner vs sugar burner, and perhaps a need to get mitochondria healthy before taking a high fat route...is that something that is addressed through diet and appropriate exercise? If mitochondria are not "right" and you went on a high fat diet, what would the consequences be...fatigue, weight gain? Good observation! You're on the right track. This is why the transition to "fat-burner" is more difficult for some people than for others. It takes time for the body to ramp up mitochondrial biogenesis, and also make enough of the enzymes involved in using fats & ketones. When you're in that in-between stage, yes, probably some fatigue, hunger, irritability, etc. But eventually, the body catches up. But I don't think there are many ways to get the mitochondria prepped ahead of time. Mostly, they become more efficient when they *have to,* like when there's very little glucose coming into the body from food, and they have no choice but to start getting better at the other pathways. But exercise can help stimulate mitochondrial biogenesis -- use 'em or lose 'em. We've got to give the mits a *reason* to stick around and stay healthy. I love this series, Amy. You have a gift for explaining human biochemistry to lay people. I look forward to recommending the entire series to family when it is complete. Amy -- Just to let you know that when I clicked on the "second post" in the series, it said that it didn't exist. Hmmmm, Back to the Future I think. So far so good Amy. Again good. One thing I was thinking about was the transformation of isolated Mitochondrion into something larger, where the synergy allowed, presumably, a selective advantage. Are you familiar with the work of Jeremy England http://www.englandlab.com/ he is exploring the energy dynamics involved in the original transition from inanimate to animate matter through entropy. Turns out the most efficient way to dump excess energy back into the environment is to replicate. Seems to me at this point in evolution his ideas may be closer to the dynamics than Darwins.